As I mentioned in a previous post, Craig and I recently took a fifteen-day cruise to Hawaii. It was a trip we had talked about taking for many years. I must admit I had some legitimate concerns about my ability to handle all the responsibility and make it a wonderful trip for both of us. In January, we took sort of a practice four-day cruise to see how it would go. There were a few glitches, but I thought I had a plan that would assure smooth sailing. Shortly after we sailed I lost Craig. It would be over two hours before we saw each other again. During that time the captain held the required muster. This involves all of the passengers reporting to their muster stations. I was sure Craig would show up there, but alas he didn’t. Security was looking for him everywhere, but couldn’t find him. Finally, Craig went to someone for help–something he never does. We were reunited just in time to get dressed for dinner. During the night, Craig kept walking out of our cabin. I was asleep and didn’t know he was gone until the security guard knocked on the door. This happened twice. The third time, I noticed he was gone and went out to find him. Just as the door closed behind me, I realized I didn’t have my key card. I found Craig right away, but we waited for an hour for someone to open our door. 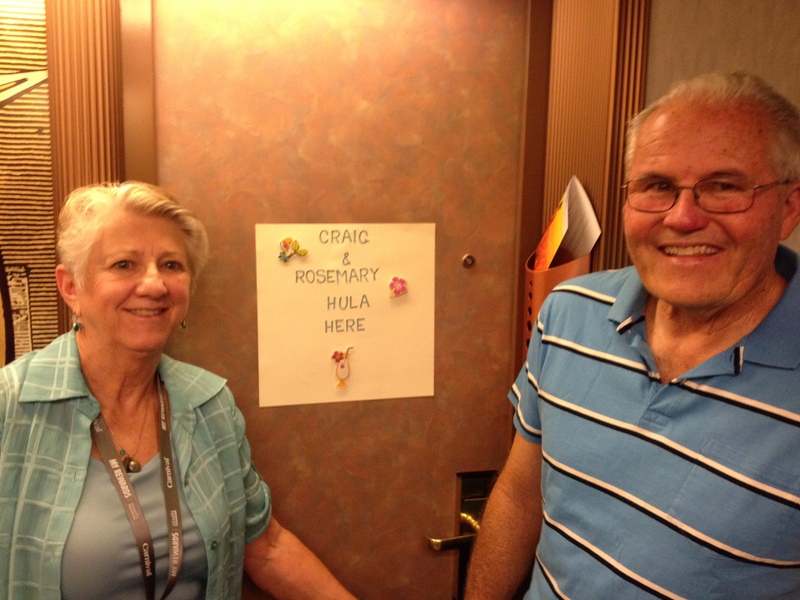 The next day, our cabin steward suggested that I decorate the door so Craig would be able to recognize it. I took his advice and Craig never got lost again. As usually happens on any vacation, there were a few other problems, but after the first day and night things went pretty well. Our trip was as wonderful as we expected. Hawaii was beautiful and we went on some great excursions. The most unexpected part of the trip was how our relationship changed. Because Craig has dementia, most of the time I feel more like a caregiver than a mate. But with so many days to be together away from our daily cares and responsibilities, it seemed like romance crept back into our relationship. Ten of our fifteen days aboard the ship were days at sea. That meant that we had to find plenty of things to do in order to fill up the time. We spent time relaxing, of course, but we are active people and like to do things. We went on a digital scavenger hunt, and took cha-cha lessons. Craig was a good sport about everything we did–even dressing up in an ugly sweater for a photo. On previous cruises, I had encouraged Craig to enter the hairiest chest contest. Although he is well endowed in that department, he would never join in. On this cruise, he chose to participate. Although he was not able to remember all the things he was supposed to do, (He did swing on a pole and dance with one of the judges.) he did his best and I’ve never been prouder. Little by little I caught glimpses of the Craig I fell in love with fifty years ago. Although Craig and I tell each other “I love you,” we were not as affectionate with each other as we had been in the past. The cruise reignited the passion in our marriage and that has continued now that we are home. 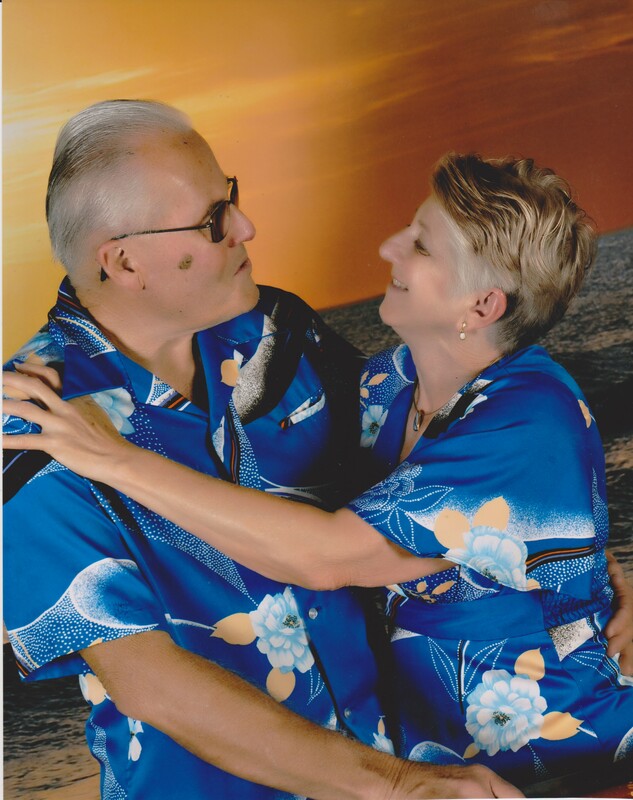 Having a partner who has severe memory problems makes going on a fifteen-day cruise seem like a huge undertaking. But moving out of our comfort zone and taking a chance has wonderful benefits as we discovered.